@SwIt Printfil 5.4 is printer software developed by aSwIt Srl: ODBC, Print for DOS, Windows. Print from DOS-Windows-Unix-Linux to Windows printers: USB, GDI, PDF, e-mail, network, fax, virtual. 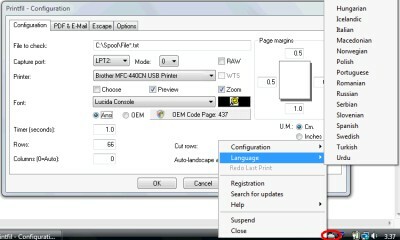 Capture LPT1:, LPT2:, LPT3: ports, and redirect the jobs, even to a printer phisically connected to the captured port. It also allows preview printing, include logos and background forms, send the jobs via fax/e-mail, use specialist fonts (barcodes etc. ), colorize the text, export in PDF, archive copies, same job to multiple printers and more. This system utilities software is shareware, which means you can download and use @SwIt Printfil 5.4 for free during the trial period (usually for 30 days). At the expiration of the period you will have to buy the printer product for $59.00. @SwIt Printfil 5.4 is available at regnow and aSwIt Srl: ODBC, Print for DOS, Windows website. @SwIt Printfil 5.4 supports different languages (including English, German, Russian, French, Italian, Spanish). It works with Windows 98/XP/Vista. Latest @SwIt Printfil 5.4 does not contain any spyware and/or advertise modules, allowing installing it with no worries concerning valuable information loss. Our website has thoroughly tested system utilities product @SwIt Printfil 5.4, written the review and uploaded installation file (1380K) to our fast server. Downloading @SwIt Printfil 5.4 will take minute if you use fast ADSL connection.